Step 1: Depending on the level and interest, start with simple figures like a triangle, square, or pentagon, then move to a hexagon, heptagon, octagon, nonagon, decagon. Using the shorter rods may be easier as the polygons get more complex. Discuss what makes a polygon and what changes happen as they increase in complexity. A polygon is a plane (2 dimensional) figure that features at least 3 straight sides and angles. 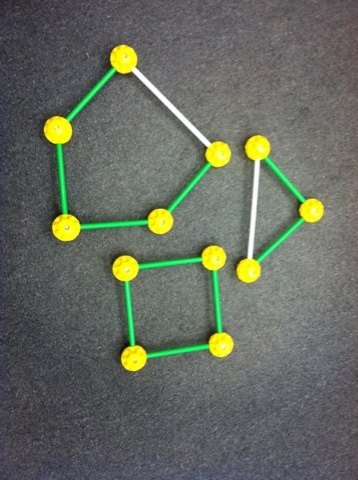 A regular polygon has sides which are all the same length as well as angles which are all the same. Examples of regular polygons include the equilateral triangle and square. A square is a 4 sided polygon. A square is also a type of quadrilateral. The US Department of Defense headquarters is named ‘the Pentagon’ . The edible plant okra is shaped like a pentagon. The British 50 and 20 pence coins are curved heptagons. Step 2: Now, using the polygon as a base, contruct a 3D verson of each plygon, which now is called a polyhedron! Although there isn’t always an agreed upon definition, a polyhedron is described as 3 dimensional geometric solid with flat faces and straight edges, such as a regular dodecahedron, which features 12 pentagonal faces and would be very difficult to use as a soccer ball. A regular polyhedron has regular polygon faces (a square or equilateral triangle for example) that are organized the same way around each point (vertex). Examples of regular polyhedrons include the tetrahedron and cube. A rectangular cuboid is similar to a cube but doesn’t feature 3 edges of the same length. The rectangular cuboid shape can often be seen in boxes. A tetrahedron features 4 triangular faces, with 3 meeting at each point (vertex). In geometry, a pyramid is a polyhedron that connects a polygon base (such as a triangle or square) to a point (apex) using triangles. The great pyramids that the Ancient Egyptians built many years ago are a rough example of a square pyramid (they have a square base). A triangular pyramid is also known as a tetrahedron. An octahedron has eight faces made from equilateral triangles, with 4 of them meeting at each point (vertex). 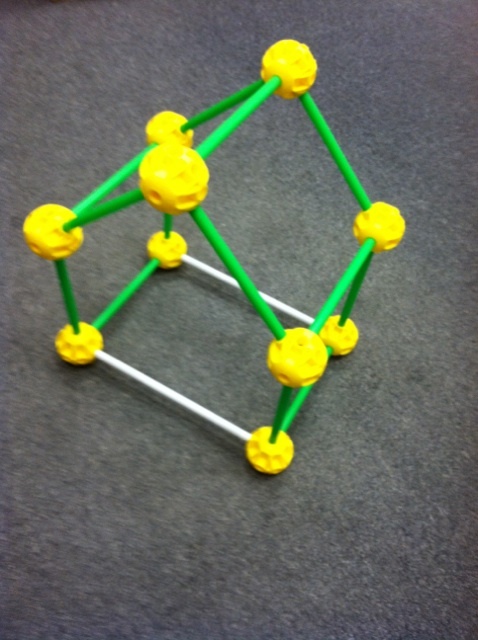 Step 3: Come up with the craziest polyhedron you can! What makes it interesting? How many sides does it have? How many planes? Take a picture if you can!